Oh, dairy. So many of us love the taste, the foods it’s in, the melty, creaminess off it, and for a lot of us, the love is so unrequited. Some people have intolerances, and for some of us, our bodies or digestive systems can’t handle it. Or maybe it causes more break outs, skin issues, or congestion. In working through my own health things, I’ve severely cut down on dairy. No more cow cheese, I just had goat or sheep’s cheese for the first time in months and that seemed okay, but I’m not going full hog into it. I haven’t done milk in ages. The only dairy I do eat is grass fed butter, and that seems to work for me. While each of us is individual and our body responds differently to foods or food groups, I would wager to say that dairy affects us more than we think, in it’s own ways. Of course, the only way to know is to experiment with cutting down or cutting it out. The hard thing can be that dairy is so all over and in food, so many people don’t know how to live without it. If I had a nickel for every time I heard someone say they couldn’t live without some form of dairy, I would be rich. 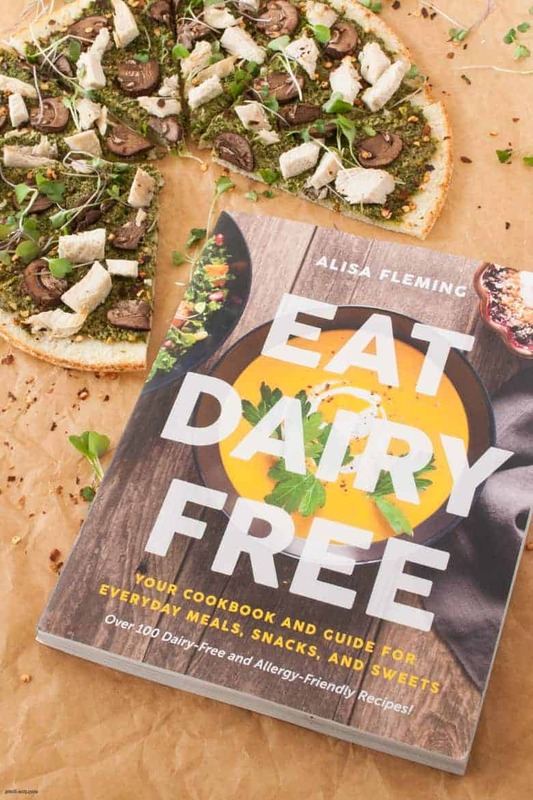 That’s where Alisa Fleming’s new cookbook, Eat Dairy Free, can really come in handy. Alisa is the voice behind Go Dairy Free, a website dedicated to sharing recipes and resources to support a dairy free life. Alisa had her own severe health issues that weren’t addressed by modern medicine. One doctor (after many others said nothing) suggested she cut out dairy. Almost overnight, so many of her health issues cleared up. Eat Dairy Free is a great primer on how to start cooking dairy free. Her recipes are familiar (like burgers, pizza, and smoothies), but with a dairy free and uncomplicated twist. Another bonus is that every recipe is clearly labelled to work with other allergies, intolerances, or food choices. Every recipe is either gluten free or has a gluten free option, which I love. Alisa is clear about making the recipes (the kind and the techniques in cooking them) approachable and appealing for people who need to be dairy free, and those that could be eating at the table with them. There are variations for diets as well, so meat eaters and non meat eaters alike will find There aren’t super wacky, expensive, or overly processed ingredients in her recipes either. She does mention using vegetable and canola oils, which I would avoid, even if they’re non-GMO. My friend and fellow NTP Beth Manos Brickey has a great article on why you should avoid them. If I make any of the recipes that call for those oils, I’ll swap it out with olive oil or coconut oil. In looking through this book, Alisa’s Mushroom Pesto Pizza jumped out at me. Pizza is one of the things I just kinda don’t eat anymore, it’s the perfect combination of gluten and dairy that will just not work for my body. So a chance to eat pizza again sounded great. Her book has two options for crusts to make, a wheat one and gluten-free one. I chose to buy a crust instead, because as much as it sounds fun, I don’t have time to make crust. And that’s okay! Pick your battles. I went with the cauliflower pizza crust that Trader Joe’s sells. It’s a combination of cauliflower and corn, but you really can’t taste the corn. It’s affordable and pretty quick to cook. The pesto is also very easy to make, and then you can top it with mushrooms and whatever else you want. We have some leftover chicken, so I cut that up and topped the pizza with that, too. Once the pizza was done and came out of the oven, I sprinkled pepper flakes over it and tossed some organic micro greens (again from Trader Joes) on top for more green. You can top yours how you’d like. When I made these for friends, I topped the veggie only version for my friends with mushrooms, cherry tomatoes, and made a meat lover’s version with slices of nitrate-free prosciutto, mushrooms and cherry tomatoes. Even in you don’t NEED to avoid dairy for health reasons, there are so many great recipes to try in this book. And it can also help you save some money, since higher quality, nutrient dense dairy usually isn’t cheap. If you’re on the fence about whether you should or shouldn’t cut out dairy, cook from this book for about a week or two and notice if anything in your body changes. Is your skin better? Allergies? Congestion? Headaches? Joint pain? Or maybe nothing at all and you’ll find out you’re okay with dairy. You won’t know unless you try, and Eat Dairy Free is a great book to do that experiment with. Disclosure: I received a copy of Eat Dairy Free to review from the publisher, BenBella Books. All opinions are my own. Cheese-free pizza is a surprising delight, especially when rich sauces and toppings are used. In this recipe, walnuts pair with mushrooms for rich, meaty, and earthy flavors, or cashews can be used for a creamier yet equally flavorful pesto. We use a good dose of parsley to add freshness and to keep the basil from becoming overwhelming. 1. Prepare the pizza crust according to the directions on the package or the recipe. 2. Put the parsley, basil, nuts, 1/4 cup oil, garlic (if using), and salt in your food processor or blender and blend until relatively smooth, about 2 minutes. With the motor running and the lid on, add 2 tablespoons water and the lemon juice (if using) through the chute or feed tube. Blend in another 1 tablespoon water if needed to reach a creamy, thick but spreadable consistency. 3. 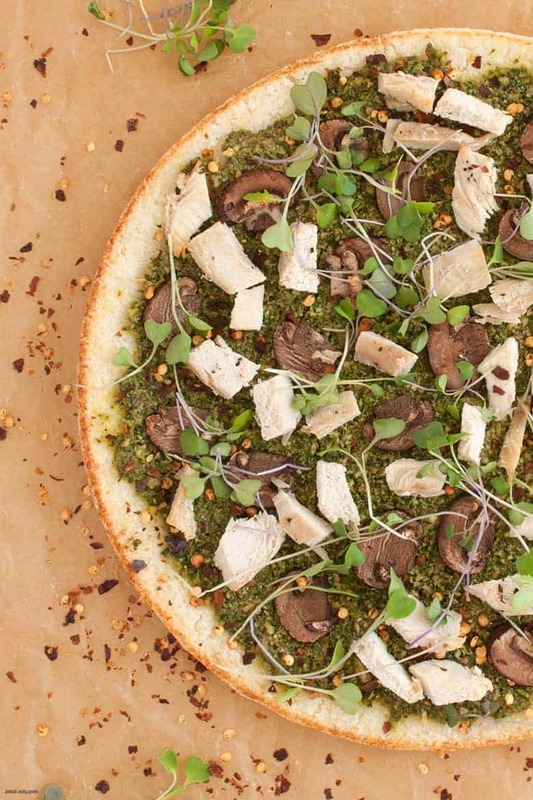 When the crust is ready to be topped, spread with your desired amount of the pesto sauce. Top with the mushrooms and any of the additional topping options. 4. Bake for 5 to 10 minutes, or until the toppings are cooked to your liking. 5. Serve the pizza with crushed red pepper for sprinkling and extra-virgin olive oil for drizzling. 6. Store leftovers in an airtight container in the refrigerator for up to 2 days. 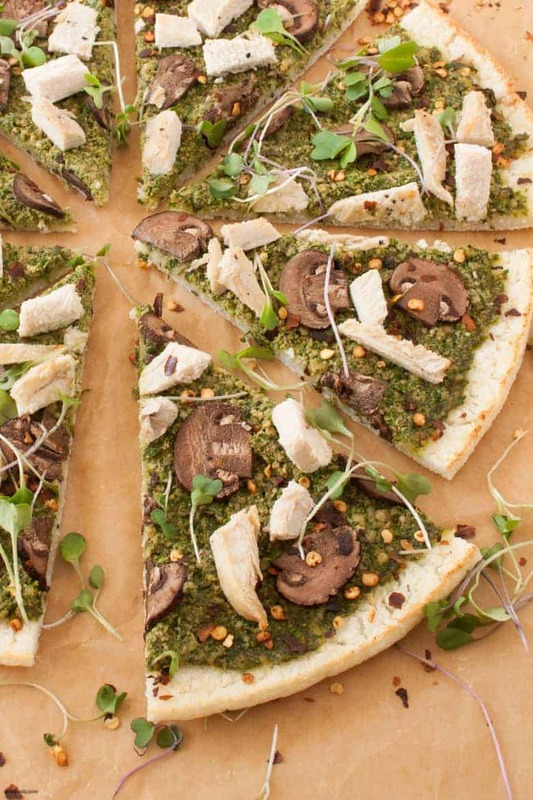 Crust Note: This recipe makes enough pesto to cover four 8-inch or two 12-inch pizzas. 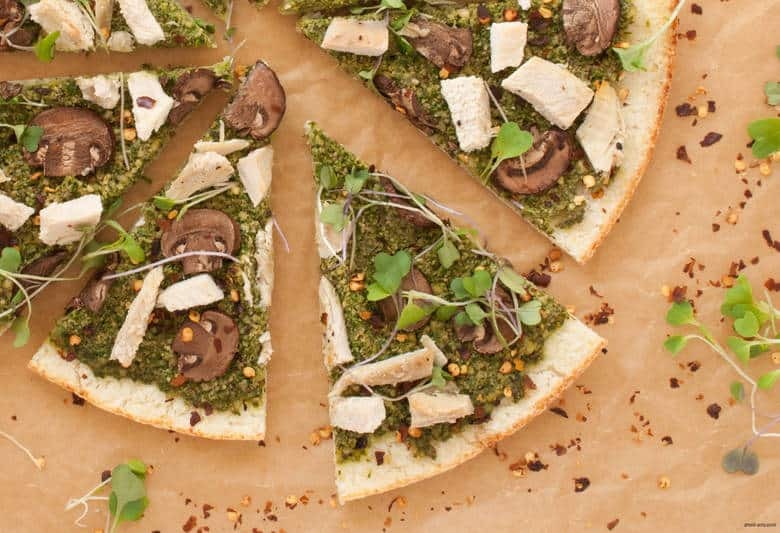 If making a 15-inch round or 11 x 17-inch rectangular crust, you will need only 1 crust, but you might have leftover pesto. Enjoy it for lunch with pasta.